A UI student-athlete receives a top award for aiding America's military heroes. Krystal Shirrell usually hands out prizes to homeless veterans during monthly bingo games at an Indianapolis Veterans Affairs (VA) rehabilitation center—but this time, she was the lucky one. Dozens of veterans gathered at the center this past spring to celebrate the $20,000 James H. Parke Scholarship that the UI sophomore recently received from the national VA Voluntary Service as its top youth volunteer. With hugs and grateful words, they thanked her for her devoted service to the Richard L. Roudebush VA Medical Center in Indianapolis. "I was pretty much in a shell and I gave up, but seeing her smile and always joyful…woke me up," said Joseph Krodel, a former center resident who has since become a VA nursing assistant. Logging more than 275 hours for veterans from September 2011 through August 2012, Shirrell has visited countless patients, coordinated volunteer efforts, and led collection drives to help homeless veterans and troops overseas. The Hawkeye softball player says, "I looked around and saw all the brave men and women who were willing to lay their life on the line to protect our country, to protect me, and I wanted to do something to support them." A lifelong Girl Scout, Shirrell says she's been volunteering since she could walk. Nearly four years ago, for her scouting Gold Award project, she delivered lap blankets to dialysis patients at the Indianapolis VA. Touched by the gratitude of the veterans, their stories, and their friendships, Shirrell made it her life mission to serve those who served the United States. The pre-pharmacy major now volunteers in the Iowa City VA pharmacy and hopes to work with veterans after she graduates. Her passion is contagious: in her Indiana hometown, family and friends join in with bingo, nursing home residents make blankets and hats for veterans, and middle school students accompany her to the VA to see firsthand the impact of their volunteer service. This past spring when the Hawkeyes played in Maryland, Shirrell organized for the team to distribute items to wounded warriors at the Walter Reed National Military Medical Center. In June 2012, Shirrell's volunteer efforts led her from hospital wings to the halls of the White House, when she was selected as one of eight women to speak with President Barack Obama on the 100th anniversary of the Girl Scouts. She met with the president and his staff about veteran homelessness and wrote an entry for the White House's Joining Forces military blog (www.whitehouse.gov/joining-forces-make-difference). As much as Shirrell has enriched the lives of veterans, they have returned the favor with constant encouragement. 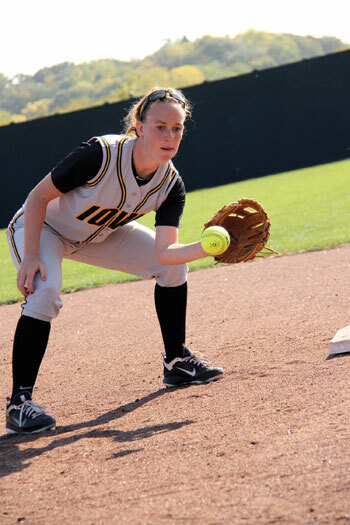 On the second day of spring practice, the Hawkeye infielder suffered a season-ending injury. She immediately received an outpouring of support from veterans, including cards, letters, and rehabilitation advice from a double amputee. Grateful for the perspective gained from working with veterans, she's ready to return to the softball field next spring. Her broken kneecap is temporary, but Shirrell knows the rewards of serving America's heroes will last a lifetime. A Palestinian community builder is among the world's most inspiring women. Meet the Iowa National Guard's first female combat engineer. At home and abroad, librarian Julie Lynch helps people and communities realize their potential with the help of public libraries. At the Iowa Medical and Classification Center in Oakdale, about 30 of the prison's 300 long-term inmates join with volunteers in the Oakdale Community Choir to explore the redemptive, therapeutic, and community-building possibilities inherent in music.